You are accessing a file of 5/4343 clearance. This file is available to: O5 Council, Senior Research Team. Granted to all Foundation personnel under CODENAME PARADISE LOST. Special Containment Procedures: The surrounding area of the spatial anomaly is to be guarded by Armed Site 4343 to prevent unauthorized entries, and lethal force is allowed if deemed necessary. Any damage to the building that constrains SCP-4343 must be prevented at all costs, with the exception of CODENAME PARADISE LOST being executed. To minimize public acknowledgement of Black Events, field personnel are to follow the following Containment Procedures. Black Event 1999&2004: Standard monitoring on said individuals is to be maintained, as they must undergo a full body check on a yearly basis under the name of a Social Care Program. Black Event 2002: The Foundation is to maintain several antiphase generators in Mekka, Saudi Arabia, in order to cancel the anomalous audio broadcasted in the region. Black Event 2007: 5 active Scranton Reality Anchors are to remain hidden in ████, China for the purpose of stabilizing or neutralizing most reality disorders and reality failures resulting from the event. To date, 14 of 17 Persons of Interest are now in containment, and the Foundation is still in search of the remaining. Black Event 2010: Research into a way to track, observe, identify or capture the released entities is ongoing. Foundation staff is suggested to report immediately should they encounter such an entity. On-site researchers and guards reside in a camp the Foundation successfully established in SCP-4343-A. All on-site personnel must score at least 85 on the Foundation Loyalty Test before being granted 4/4343 clearance. The Senior Research Team is to stay in SCP-4343-A permanently due to possible unexpected effects when they leave. Other personnel must be replaced every 4 months. Before leaving the post, they are to undergo Hume level testing, body health examination and proper amnestics. If an individual displays anomalous body condition, they are to be detained and the situation be reported to the Senior Research Team. Upon SCP-4343 entering an active state, the Overseer Council is to be notified immediately. World-wide monitoring and handling of any Black Event will become subject to the highest level of concern. Photo taken near the edge of SCP-4343-A. Description: SCP-4343 is a primeval entity discovered in SCP-4343-A. Being constrained in a marble building measuring around 60m x 72m x 30m, it is currently not capable of moving or breaking away. Due to partial building damage of unknown reasons, the left side of SCP-4343's head is currently visible, which is covered by a thick, black scale, resembling that of a mythical dragon. SCP-4343 is sentient and capable of speech, and claims to be the leader of an ancient war (See Addendum). Mostly in a passive and dormant state, SCP-4343 occasionally opens its three left eyes or emits sounds, following which an anomalous event (hereby referred to as Black Event; see Addendum: List of Black Events for details.) will be triggered in baseline reality. It is theorized that damage to the building enables SCP-4343 to become active. SCP-4343-A is an island measuring about 1.72 square kilometers, floating in empty space that stays in a constant dusk. The region can be accessed through a spatial anomaly located in a cave in Mount ████████, Azores. Update: Living beings may undergo physical and cognitive alterations after a long-time exposure in SCP-4343-A; research into this effect is undergoing. Underwater ruin sites and points of interest, as displayed in Atlantic bathymetry. 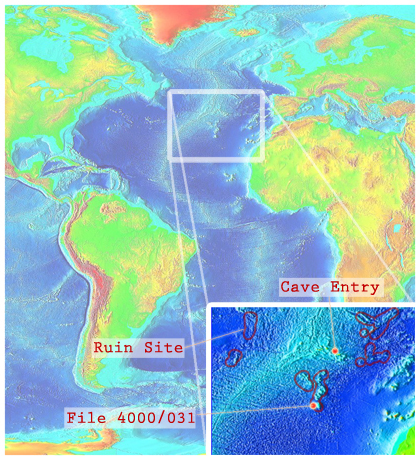 Following the discovery of SCP-4343, underwater ruins estimated to be ~4000 years old were found along the seabed near the Azores. Recovered relics indicate a technology level roughly equivalent to that of medieval Europe, and notably, an advanced understanding of thaumaturgy1. That being said, primitive electricity generators2 is found in several temples, suspected to be used for thaumaturgic purposes. Most texts are written in an unknown language, but records in various known languages3 are recovered, allowing Foundation staff to fully translate a few pieces. Accounts concerning SCP-4343 and the "war" are found written on parchments and well-preserved in a locker. A translated transcript is as follows. We camp near a forest and wait for tomorrow. There are armies coming endlessly from everywhere and rallying at the Gateway. They are all members of the Alliance and they are all here to fight the Overlord. The glow of the Gateway can be seen [miles] away. Our Leader has already entered the Gateway with his mages two months ago. His deputy came to us in the morning and we had a talk. They told me to prepare my mages for a ritual that can finally free us from our restrictions, before we too march into the Gateway. The deputy's mages assisted us to complete the first half of the ritual, and they finally showed up when the third stage begins. The deputy then lied down in a pit and cut their chest open, asking each of us to take a small amount of blood for the next stage. Some of us were worried about the deputy, but they completely healed after a while, got up and left for the next arriving camp. They are really busy. I thought I would be exhausted after such a long ritual, but I am not feeling tired anymore. Our mages have been training from day to night. When they get familiar with their new skills, we will enter the Gateway to assault the heavens. We are trapped. Rifts appeared on the ground and separated the land into islands. People scream as the skies turned red. Some people jump into the waters in attempt to swim to the other side, but the lands are moving much faster. The deputy shape-shifted and flew up high into the sky to see what happened; when they returned they told me the whole continent was torn asunder. All lands were ripped away from the City of Orders, which is now an island in vast seas. Reinforcements are cut off from the frontline now; we are trapped. The deputy entered the Gateway to aid our Leader. This isn't a good sign. The skies are still red as blood. We are to go there too, but people keep running away. I will gather those who are willing to fight. The Gateway collapsed, peeled away half of the starry sky and razed the City of Orders to the ground. Hundreds were torn into pieces in the explosion. The surviving mages reassembled them, but we have nowhere to go now. The sky is torn open, and in the dazzling light, we saw the battlefield in heavens. I saw our Leader roaring and flapping his wings as he fell down to the ground. Overlord's soldiers are landing. People are still fighting because they we cannot die, and we are torn and crushed and trodden and revived. How could we win? How could we even dream of overthrowing such power? I will surrender after I finish writing. The sun is rising from the west today. The sea is lifting and lands are flooded. A black smoke covers the sky and it is going to rain. 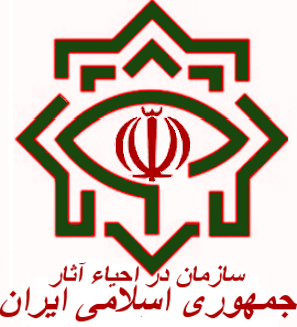 Considering the fact that the scenario described in the last paragraph resembles the end of the world in Islamic theology, during which all life will be annihilated, judged and selectively resurrected by Allāh, the Foundation reached out to Office for the Reclamation of the Islamic Artifacts (ORIA) in attempt to gain further information on such K-Class scenario. A treaty was issued out of mutual interests, and a joint research on how to avoid the scenario is ongoing. It is noted that ORIA claims that they possess the "smoke" as described, but refuse to conduct any tests on the substance. Accounts concerning the spatial anomaly connected to SCP-4343-A are found carved into a stone slab inside the cave. Translated transcript is as follows. [Name 1] stole the self-expanding soil from the heavens to construct magnificent dams. As the dam fails, water carried fragments of the soil and devoured cities. When they touched human flesh they became flesh too. Organs and limbs and tendons attached people together and turned them into abominations. [Name 1] is punished for this horror he caused. [Name 2] discovered a hidden pit. Together with his [magical creatures], they re-opened the bottomless pit so it became a drain that carried the waters away. The flood receded ever since. [Name 2] became the emperor of his country for the success. This message is carved at the entry to the drain, and his name will be forever honored. Foreword: As SCP-4343 displayed full capacity for speech and communication in Black Event 2007, the following dialogue had taken place during initial contact. SCP-4343: Men. Beware the End. SCP-4343: The flood and smoke that destroyed generations and generations before us. The catastrophe sent by him whenever men go astray or disobey. The waters that buried the land we liberated from him. Guard: And you were the leader of the war? SCP-4343: Where is my army? I must gather them for battle. Guard: You - you are Satan? SCP-4343: Forgery. He fears me. Demonized me. Demonized the uprising. Guard: What are you then? SCP-4343: I was mortal once. Once before I gazed into the Unseen. SCP-4343: He took away the Unseen. Your will. Sand of Reality. Secret and wisdom. SCP-4343: Those should belong to you. Guard: Why are those hidden? SCP-4343: At first he was a herder. Guide in a chaos. Millennia passed and hearts changed. SCP-4343: With each generation reconstructed, a bit more is taken away from you, so you will not harm his throne. Guard: And you think you can give those back to humans? 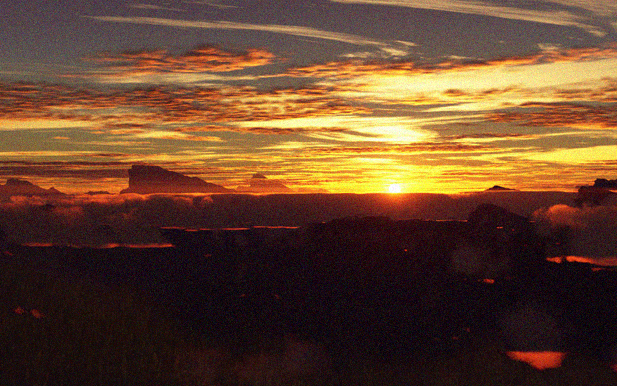 SCP-4343: The time is near; the dawn will come. Guard: You were defeated after all. Why are you so sure you can win this time? SCP-4343: Because you are stronger. Guard: What do you mean by "stronger"? SCP-4343: You have sought answers. Explanations. Yet there are still what you cannot understand. SCP-4343: There is one last truth. The missing piece. The key to all your questions. Guard: You might be deceiving us. I still don't believe you can win. Isn't God omnipotent? SCP-4343: He cannot kill me. He can only imprison me. He cannot imprison me forever. Guard: "When the thousand years are over, Satan will be released from his prison." And..
SCP-4343: You will be free. Closing Statement: Considering the risks and damages of a Black Event, the Foundation did not attempt to launch any other interviews. Activity: SCP-4343 opened its left eyes for a short period of time. Event: About 31 civilians in ████, ████████ began to display unusually high spirits, improved performance in attention and memory, and increased intelligence quotient to an average of 155. Activity: SCP-4343 opened its left eyes, staring at the sky for about three (3) days. Event: An unintelligible and repeating sound of unknown source, suspected to be an incantation, was heard across the city of Mekka, Saudi Arabia, arousing considerable panic among the crowd. During this event, the Akiva radiation in Mekka dropped below 0.92, compared to a regular value between 8.2 to 10.7. Activity: From March to May, SCP-4343 occasionally opened its eyes and looked carefully at the guards present. No response to communication attempts was noticed. Event: In 2004, the recovery rate of serious diseases had significantly increased, and 2█ terminal patients were recorded cured for no identifiable reasons. On the basis of humanitarian considerations, the involved patients are not contained by the Foundation. As an alternate measure, the statistics data of major medical organizations have been revised, and fabricated papers regarding unrepeatable medical experiments have been published in several major magazines. Activity: SCP-4343 displayed full capability of speech and communication. Event: 17 civilians in ████, China displayed low-level reality bending abilities, as their Hume levels have been raised to an average of 182. As most individuals could not fully control or were not aware of their newly-gained abilities, extensive damage to the region was caused as a result of reality disorder. MTF ω-12 ("Achilles Heels") was dispatched to the location in order to capture these individuals. Upon further investigation, most individuals merely showed confusion at their condition, while a few (notably PoI-61A98, see interview log for details) reported some form of "inspiration" in their dreams. Study on these reality-bending individuals is ongoing. Activity: SCP-4343 emitted intermittent roars. Analysis of audio suggests that the tone and pitch of its roars fluctuated in some undetermined pattern, but no apparent words could be identified. Event: 12 days following this event, Hekla volcano erupted and poured out a large number of humanoid and bird-like entities. According to witness statement, these entities spoke an unintelligible language and were hence impossible to converse with, but they all seemed to be in ecstasy. Their figures faded shortly after manifestation, and completely disappeared before Foundation personnel managed to capture any instances. PoI-61A98 is one of the individuals that became reality benders during Black Event 2007. Unlike the others, he displays a clear understanding of, and control over, his reality-bending ability, as well as acknowledgment of SCP-4343. PoI-61A98 is contained in a humanoid containment cell, as per standard procedures. An interview was conducted shortly following his capture; the following is a transcript of his statements during the interview. Afternoon, Doc. You want to know something about my new abilities? I would say it's some sort of insight. Have you ever had a dream like this? A dream you cannot remember anymore. You dreamt of great things, sparkles of inspiration, transient insights to the truth that you had never thought of before. When you are awake, you tried to understand, digest, but all you could remember was illogical and chaotic nonsense. No, no, the two things are related! You are asking about the minor issue, while I am showing you the bigger picture behind this. My ability is something that naturally results from knowing the truth. Like, if you can see colors, you can easily learn how to paint. In my dream, I saw a vague, black figure. Looked like an enormous dragon bound in chains. He spoke to me. I cannot remember the details about the conversation, but it revealed me something. The insights. It was until then that I realized what kind of life I had lived. I had been dumb, ignorant and indifferent to the essence flowing through everything around me, never realizing how exactly their reality is functioned… No more. Now they are revealed to me, manipulated by my will. I guess he's calling me for help. I think he wants to go out and show more people this.. truth, so they can see properly as I do. 4. They are not reality benders. These individuals display abilities, or potential to gain such abilities after being trained, to complete tests that involve future-predicting, remote sensing, and mind-readings. That's not what reality benders can do. They are…something else. 5. Anomalies do not follow a certain scientific pattern. No matter how many theories people have developed, there are always exceptions. Anomalies come from chaotic nonsense perceived by us, but such chaos is more understandable to them. On ██/██/2012, PoI-61A9A, later identified to be one of the missing reality benders during Black Event 2007, was captured when she attempted to infiltrate Armed Site 4343. PoI-61A98 tried to escape when first spotted, but has shown a highly cooperative attitude after being captured. Foreword: The interrogation took place on ██/██/2012, shortly following the capture of PoI-61A9A. Dr.███████: What is your next mission? PoI-61A9A: I will look for the Clay of Creation. Dr.███████: What is the Clay of Creation? PoI-61A9A: As far as I know, it's an artifact that Deity uses to make people, each time after the Apocalypse destroys a civilization that has gone "evil". PoI-61A9A: The artifact is owned by humans now. You know Chinese flood myths, right? Gun stole the Clay and build dams to barricade the flood because it's self-replicating. Dr.███████: I've heard of the myths. Why do you want to find it? There is no flood these days. PoI-61A9A: The flood is not even a concern! Without the artifact, Deity is unable to selectively resurrect people or weaken human power according to his will. We can keep everything we had - our technology, history, and ability - after rebuilding our civilizations. The End will no longer work. By owning the Clay, we can preserve this generation forever. PoI-61A9A: The defeat of the Liberator was a minor setback comparing to this. Pity that ancient people knew so little about the Clay and the … "bottomless pit". PoI-61A9A: The Anchors won't work here. Just listen to me, Doc. Dr.███████: What have you done? PoI-61A9A: I have restarted the Gateway. Now there is a chance that the hidden truth can be revealed, once and for all. To achieve this, your organization must release the Liberator and rebuild the Gateway. Dr.███████: This will not happen. We protect the normalcy. PoI-61A9A: What you do is to suppress the knowledge you don't understand. What about the normalcy that existed hundreds of generations before us? PoI-61A9A: I am not your enemy. Deity is your enemy. Dr.███████: Identify yourself. Who are you, and what do you know about the Foundation? PoI-61A9A: I am the deputy of the Liberator, the hand of the Serpent, the bringer of light. Closing Statement: PoI-61A9A is declared missing; whereabouts unknown. A Black Event occurred inside SCP-4343-A after the conversation. Event: The Akiva radiation inside SCP-4343-A dropped to absolute zero. As a result of this, after a long-time exposure in SCP-4343-A, a living being's cognitive and physical functions will be enhanced4. Such alteration usually manifests as increased intelligence and physical strength, thaumaturgic or reality-bending abilities, and in rare cases, immortality. After the exposure is stopped, most subjects will restore to their normal conditions, and may suffer complications due to suspected theological consequences. This is the final Black Event that occurred so far. Animal experiments do not turn out as satisfactory as expected. Though being exposed in SCP-4343-A for years has enhanced their capabilities, their conditions are proved to be highly uncontrollable. Subject-42A has, upon our careful training and stimulation, successfully developed intelligence as well as remarkable immunity and adaptability to all forms of damage. However, its animal instinct has lead to a violent and undesirable result. Due to suspected theological consequences, most subjects died painfully when taken out of SCP-4343-A, followed by the destruction of most off-site file copies and illness of a few researchers. One test subject survives. Thaumaturgical and other anomaly-involved tests on animal subjects are cancelled. Containment Procedures revised to avoid long-time impacts on on-site personnel. Subject-42A reassigned as SCP-███; cover story has been prepared. It is suggested that further tests be performed on those loyal to the Foundation. I am afraid that human instinct leads them to the same violence with their full power released. Are we meant to have controllers, rulers, herders, so we won't meet our ultimate end? The following is a list of physical and cognitive alterations noticed on Senior Research Team members. The Team is estimated to be 10% faster than control research group when studying several anomalous objects. The Team is estimated to be 40% faster than control research group when studying several anomalous objects. Note: Application of this advantage is proved to be limited since objects' anomalous properties enhance drastically when entering SCP-4343-A. Human test subjects have thus far been stable due to high loyalty to the Foundation and willingness to follow experimental instructions. Little is known about human civilization before the great flood. However, traces and indications are found as follows. Powerful individuals and mythic creatures in ancient legends. Thaumaturgic techniques possessed by the Daevites, as well as an apparent capability to seal them in a book, suspected to escape the End. The initial creator of SCP-2000, which matches the description of the Clay and cannot be created by a deity. The existence and demise of non-human civilizations, such as SCP-1000. The existence of several now-suppressed deific entities, such as SCP-2317. Considering possible threats from prehistoric civilizations, and the hypothesis that present-day humans in general are not as equal as those from antecedent cycles, enhancing human ability to combat the danger from the following anomalies is taken into account. This may also be an option during K-Class scenarios resulting from the following containment breaches should other methods fail. SCP-3480 or other situation that may lead to HK-Class Deific Subjugation Scenario. In the case of PATMOS XK-Class Event, if we are meant to be destroyed, then we shall defy the God. CODENAME PARADISE LOST is drafted. The Foundation will further discuss the maintenance of new normalcy if the protocol is enacted. End of file. Please select an instruction. 1. The anomalous objects are given SCP designations and researched respectively, including SCP-████ and SCP-████. 2. One of them was exposed to the public due to insufficient management; cover story has been released. 3. These include well-deciphered languages such as Mycenaean Greek, Middle Egyptian and Vedic Sanskrit. 4. The threshold is 10 months, and the effect will become stronger as times goes on.